Print and/or capture the full screen, active window, client area, any user-defined area plus full DOS screens, 2x-to-8x zoom capture and entire contents of scrolling Web pages. View captured images in the zooming image viewer or in the hi-res thumbnail viewer. Image Cataloging System with automatic visual bookmarking organizes your images. 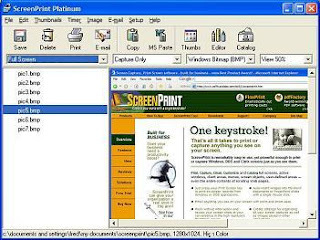 One click pastes images into MS Word or PowerPoint and attaches images to messages in any email program. Print single images, as many to a page, with captions, user name and time-stamps, stretch to full page. Quick-save multiple images and auto-delete unwanted images. Auto-capture with a variable timer. Enhanced Image Editor with 27 special effects plus save and batch convert images to the most popular graphic formats. Does not register components in the Windows Registry and client/server installation does not require any files on workstations. Terminal Server and Citrix compatible.